The trace element zinc may be one of the most important minerals consumed in the human diet. Being responsible for approximately 100 - 300 various chemical processes in our biological systems. This particular essential mineral is one we cannot live without. Zinc serves primarily as a co-factor to an estimated 60 plus different enzymatic activities, taking place in our bodies on a daily basis. Many of these enzymes directly coincide with our body’s ability to metabolize all nutrients consumed via dietary foods. Zinc is needed to repair wounds, maintain fertility in adults and growth in children, synthesize protein, help cells reproduce, preserve vision, boost immunity, support the healthy function and maintenance of the skin and protects against free radicals, amongst other functions. Zinc Aspartate supports healthy cognitive function. It is the answer to new skin and sperm cells. It supports the immune system and works to produce the cells you need to stay healthy. 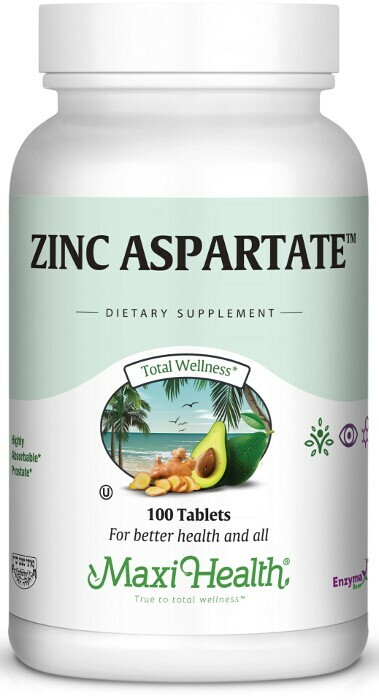 Try Zinc Aspartate™ from Maxi Health Research®. Take one (1) tablet daily, or as directed. Other Ingredients: Dicalcium phosphate, microcrystalline cellulose, vegetable stearine, vegetable magnesium stearate, modified cellulose gum, Enzymax® (calcium carbonate, bromelain, papain, lipase, amylase, protease, silica), aqueous film coating. This product contains no animal products, soy, wheat, yeast, gluten, sugar, salt, milk, artificial flavors, colors, or preservatives. Enzymax®, a vital digestive enzyme complex, is a registered trademark of Maxi Health Research®, LLC.